When it comes to vintage Mercedes convertibles, it’s not at all surprising to see low-mileage examples like this 1968 250SL pop up. These frequently became the weekend drivers of the elite, not intended for daily commuting and perhaps even left behind in summer homes when the weather turned cold. 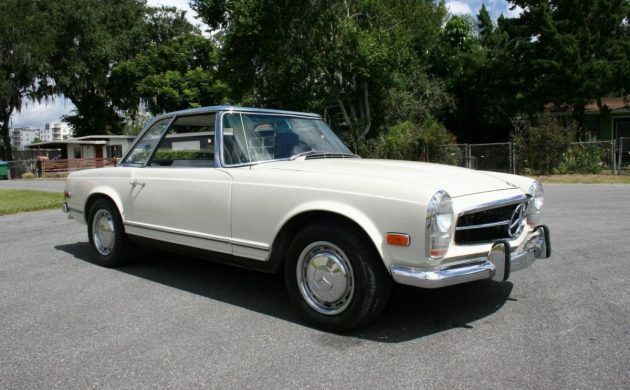 Whatever the story is, this W113 “Pagoda” appears to be in excellent condition, and the seller is asking a heady $59,900 for the 25,114 mile example here on eBay. Little information is offered, which is unfortunate considering the abundance of original details that must be contained in a car like this. Interestingly, the hard top is a different color from the body. Some additional research confirmed this two-tone look was achievable directly from the factory, but in order to be correct, the hubcap centers should match the hardtop. Given the hardtop color corresponds to the green leather interior, I’m inclined to believe the hubcaps were either replaced or repainted. 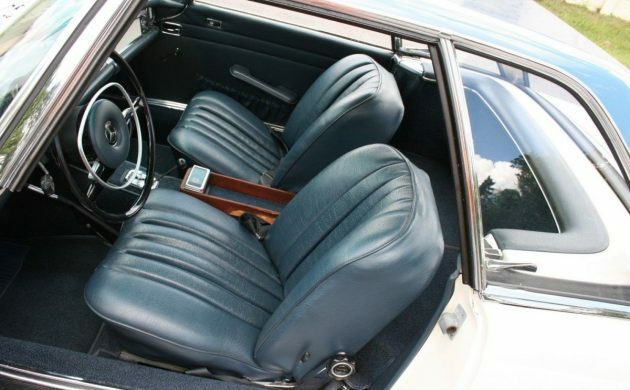 The interior looks a bit over-stuffed to me, as if the seats were redone with the incorrect amount of padding. A quick Google Image search seems to confirm this suspicion, as the sides of the shoulder back appear to curve around the driver too aggressively; other photos show a flatter upper portion of the seat. It could be the photo angle, too, so I’ll let our Mercedes experts either confirm or debunk my views of the interior’s authenticity. 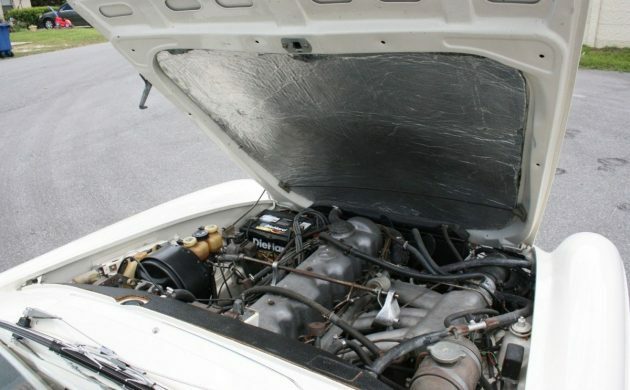 The hood insulation / heat shield also gives me some pause, as I can’t imagine Mercedes using such cheap-looking material in a highly finished car like the W113. 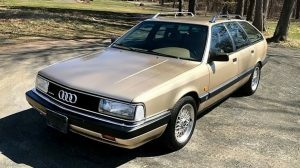 It’s entirely possible this low-mileage example needed some quick work after sitting for many years, but that should really be divulged by the seller – especially with so many seemingly glaring details that appear to be non-OEM in spec. Again, this is armchair quarterbacking at its finest, but with so little information in the listing to go on, it’s tempting to make conclusions of your own. A beautiful car, but as the writer notes, too many red flags for that asking price. Nowhere near the original condition that would command that type of premium. Seats look upside down in the photo. Underhood insulation is a common upgrade by owners who drive these cars and don’t allow the grass to grow underneath them. Price is top money for a pagoda in this condition. But, I’m inclined to let my friend with a factory-refreshed one give me rides from time to time. To me, this is a very boring color combination. I agree on the seats- just don’t look right. Hubcaps look like aftermarket ones that the mfr didn’t bother to paint correctly. Hood insulation looks like it’s from Home Depot. Wouldn’t be too hard to make it right, but should be priced accordingly. According to the data plate the SL was delivered with a white hardtop matching the body color. Together with the unpainted hubcaps many people had their hands on the car. I doubt the mileage is correct unless the orignial owner proves it. Probably there is no chance to ask her or him anymore…. Oddly, they used no hood insulation. A restorer is left with a bit of a Hobson’s choice there. Odd colors. If the mileage is accurate, might be worth it. If the car can be verified in some way, I agree priced at the top of the market. Does anyone not believe that a good driver like this will not appreciate? Well priced. Seriously go over this car with a magnet prior to purchase. These can be amazing rust buckets and if a good body man and or flipper does not do the work properly. Even low milage cars can be dangerous. There are designed in pockets that can hold water. That is why so few of them are still around and with a unibody construction is hugely expensive to fix. I love the look top on, up or top down. They are great cruising cars and boulevard gliders. Not bad handling, good brakes and very comfortable. Hugely reliable on the mechanical end but figure much of the rubber needs to be checked and replaced given the age. 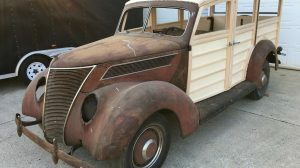 I think the price is high without the checks I noted but if this is a rust free car the items you flagged are easily fixable to bring it back to proper standard. Then the price begins to make sense. BUT CHECK IT OUT these can be serious many pits. 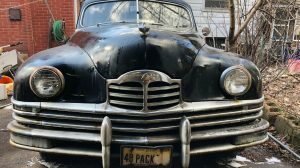 I have seen more than one go thru owner after owner pouring money into them and getting the car only part way to full restoration and driving condition and then having to sell as the cost to get them right drained them dry. Hardtop and paint codes are on the last photo, 050 G, both are white. 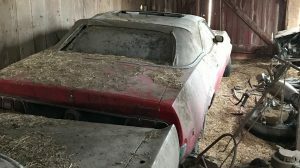 First off, NOT A BARN FIND! (So it should not be listed here unless BF is changing names to something else) 2nd. The price is not bad for this vintage, but only if the car checks out. I searched for a W113 for over 3 years, looked at about a dozen myself and paid to have at least 6 others inspected. All were in the $50k-$80k range and this was starting in in 2014. NONE were as advertised, mostly because of undisclosed rust, but some had bad engines, bad transmissions, a lot of poorly repaired damage, etc. If you find a nice one, these are great cars. But it is very unlikely that you will find a nice one that doesn’t need some kind of work, even in the $90k+ range. All of the body panels are welded on including the front fenders. To replace a front fender, which is almost certain to be damaged or have rust repair, you have to remove the windshield and dashboard. Just by itself, that is a $4k repair job, not including paint. Grills for these, if you can find one are $5k. After spending a significant amount of time and money looking for one of these in good shape, I gave up. Don’t fool yourself. 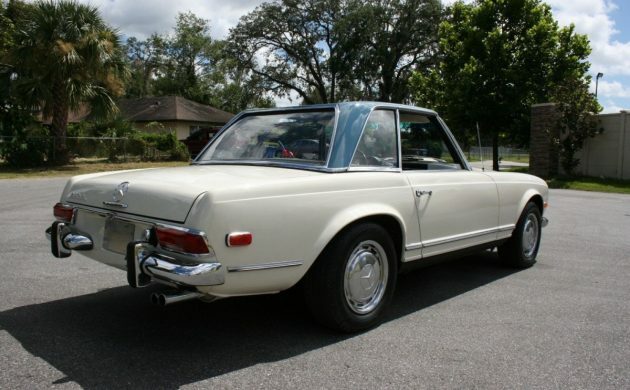 If you want a pagoda in decent shape, say, an honest grade 3, it will cost well over $100k to either buy a good one or restore whatever one you find. $60k will buy you something you can drive for maybe a year without having to empty your wallet into it. A nice looking car but an apparent lack of details and full disclosure would normally suggest an intention to conceal its legitimate pedigree. Personally, I avoid these types of sellers.